Healthy NY is no longer available for individuals and the self employed. The closest cost effective option is the Essential plan. Please use the above link for an instant quote. Are you looking for Healthy NY quotes and coverage? You’ve come to the right place! At Vista Health Solutions we offer everything you need to get Healthy NY coverage and quotes all in one place. Simply complete the quote form above and you can instantly compare health insurance quotes that you qualify for. Have questions about the Healthy NY application and Healthy NY requirements? Call us today at 888-215-4045 to speak with a customer service professional that can answer all of your questions about the Healthy NY program. Healthy NY was designed to help promote comprehensive and quality health care for small business owners and their employee’s. The program also helps sole proprietors and those whose employers do not provide health insurance for them. Applicants may now also choose a benefit package with a limited prescription drug benefit or a benefit package without a prescription drug benefit. Vista Health Solutions offers several quality health plans to those who qualify. By filling out the Healthy NY application above you can view quotes instantly! Vista Health Solutions deals mainly with the Empire and Oxford health care plan providers to bring you the most comprehensive coverage possible at the lowest available Healthy NY cost. Download our Healthy New York Insurance Informational Guide. May require PDF Reader. The data above shows a comparison of the distribution of coverage in New York and nationally. Every year the Census Bureau conducts a survey regarding American families health insurance status and the kind of health plan they have. The respondents of the survey were individuals aged between 19 and 64. This is the age group that enroll in the Healthy NY program. The survey indicates that the number of individuals enrolled through an employer sponsored health insurance plan in New York is the same with that in the national level. The rate of uninsured in New York is a little lower than the rate across the nation. A lot of the insured in New York are enrolled in government-sponsored health insurance programs like Medicaid, Family Health Plus, etc. But the rate of uninsured has increased both in New York and the US. The uninsured rate in New York has increased by 1.5% while at the national level the increase is at 1.2% (for those with children) and 1.6% (for those without children). 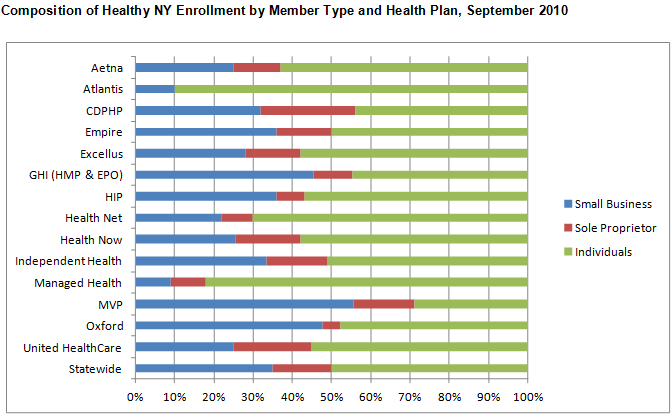 Overall New York has a lower number of uninsured when compared to that of the entire country. Improvement is seen among the working individuals in New York particularly among part-time employees. It has gone up from 24.7% to 26.4%. The table below reflects members’ and employers’ feedback regarding Healthy NY. Burns & Associates, Inc. (B&A) conducted two surveys, one for business owners and one for individuals. The surveys were designed in such a way that respondents covered all the various health plans, regions, number of years enrolled in the program and product selection. The survey for employers had 18 questions and the member survey had 16 questions. Most of the questions in both surveys were the same. Surveyees were asked to rate their satisfaction of the program in these aspects: cost, customer service and application process. They were asked to indicate their degree of satisfaction from very satisfied to somewhat satisfied. The table below reflects the survey result and you can compare them with last the previous year’s satisfaction rate. Every year a survey is conducted to check how members feel about being part of this health insurance program. This information is included in their annual report. The survey was conducted by Burns & Associates, Inc. (B&A) during the summer of 2010. Burns & Associates, Inc. (B&A) collected information from both the Insurance Department and insurance carriers from whom more than 1% of the Healthy New York members are enrolled. The table below shows how the respondents applied for the program. Results are very similar to the previous year. The plan’s premium rates played a major role in the respondent’s decision-making in terms of health plan choice. Members are more satisfied now (2010, when the survey was conducted) than in the previous year. In the comments section however, members indicated several aspects where members are not happy such as the prescription limit ($3000 per coverage year), no coverage for dental, mental, vision and chiropractic care, annual physical that’s limited to one in three years. The average contract size was 1.40 members. An average contract includes the policyholder and his/her dependents. Individuals have a lower contract size compared to sole proprietors or members of employer-sponsored plans. Majority (51%) of the members are individuals; 13% are sole proprietors and 36% were enrolled in group plans of small businesses. The table above gives you a picture of the membership information of health plan providers. It is noticeable that the distribution of member types vary among providers. There are some providers like MVP and GHI where majority (50%) of their members are small businesses groups. From 2006 to 2010, small business membership has grown from 27% to 35%. But the sole proprietors’ population decreased from 17% to 13%. The same is true for individuals. Membership has decreased from 56% to 52%. In terms of product selection, HMO plans without prescription have been gaining popularity in the recent years. It has become a popular choice among sole proprietors and individuals. High deductible products on the other hand remain to be unpopular. See table. The table below shows you the membership distribution for every region in contrast with the regions’ population. Capital District Region, Hudson Valley and Long Island have a higher percentage of membership compared to the region’s population percentage. How much does Healthy NY cost? Find out by completing a a healthy ny application above and you will get side-by-side rates instantly on a Healthy NY plan that works for you! If you have any questions about your Healthy NY application or the Healthy NY requirements call one of our customer service representatives at 1-888-215-4045.